Batman - Bruce Wayne, Murderer? Bruce Wayne has just reached his. When he is found with the dead body of Vesper Fairchild in his arms, a chain of events begins that will leave the Batman mythos changed forever. Arrested and imprisoned for murder, alienated from all whom he has ever called ally, Bruce Wayne stands poised to lose his own identity to the specter of his dark knight counterpart - Batman! What would happen if the line between Bruce Wayne and Batman was shattered? 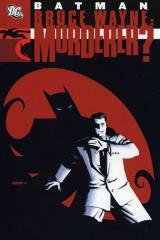 Featuring story and art from some of DC Comics' top talents, Batman: Bruce Wayne - Murderer? collects all relevant segments from the ground-breaking Bruce Wayne: Murderer? event, as well as the startling conclusion from Batman #600.